Inline pumps of all types including P type pumps. Common rail pumps and injectors of all makes. EDC / Electronic VE pumps. CE Certified design of Digital LCD display (Hewlett Packard), electronics Developed in collaboration with "Godrej India" electronics team. Fly wheel with calculated moment of inertia fitted with Bosch Flexible Coupling. Center height = 125 mm. Computer display of all parameters. Results and can be saved and printed. 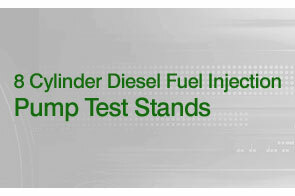 Two modes of testing available for diesel pumps: Automatic and Manual. Oil collected in test tubes can be electronically / automatically drained through the computer. All pressure gauge outputs displayed digitally on the computer screen. 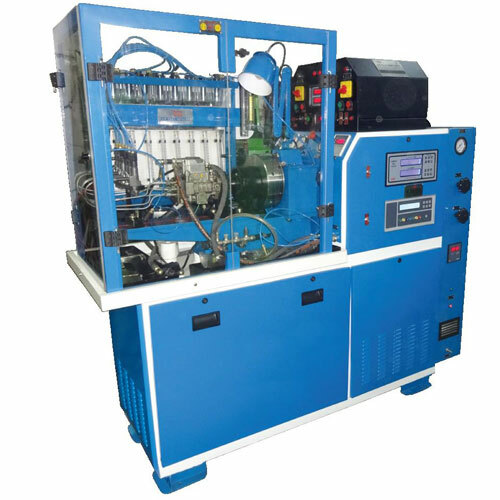 Heater and chiller system precisely controls the preset fuel temperature with auto cutoff system which maintains the temperature at 40 +/- 1 degree Celsius. Stroke counting and timing facility operated through the test bench computer software. Return flow of Rotary, VE and Common rail pumps is measured digitally in cc / min and is displayed on the test bench computer. Power Supply: Customizable according to Customer requirement. EDC / Electronic VE pumps such as Bosch VP Series - VP 36, VP 37 etc. Bosch Distributor V.E. Pumps and other rotary pumps. Inline pumps of all types including 'P' type pumps. All types of Lucas / Delphi Rotary pumps including 'DPC'. Note: The DD 800 CR has two independent work stations each with its own independent motor and drive so that 2 operators can work on the bench simultaneously. 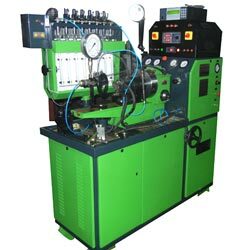 - One side comes with a 7.5 HP main motor and electronic drive and is used for testing conventional diesel pumps like inline, rotary etc. as well as EDC / electronic VE pumps up to 8 cylinders. 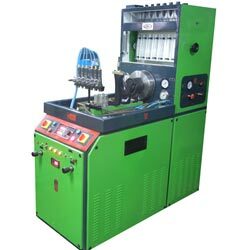 The other side is dedicated for use in testing of Common rail injectors and pumps of all makes and comes with a 5 HP main motor, electronic drive and properly shielded work area for operator safety. 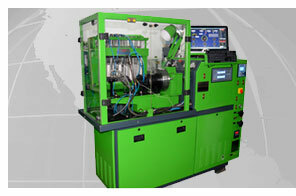 Test bench comes fitted with the CRTK 5000 test bench kit for common rail testing. The kit includes 1. Bosch CP1 common rail pump along with a foundation suitable for all types of Common rail pumps and a suitable coupling, 2. Bosch fuel rail fitted with a pressure sensor and fuel rail pressure control valve / solenoid / DRV, 3. 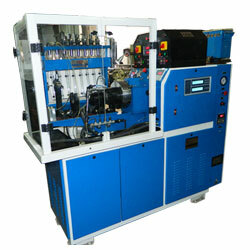 CRT 5000 electronic simulator for driving common rail injectors, pumps and fuel rail, 4. 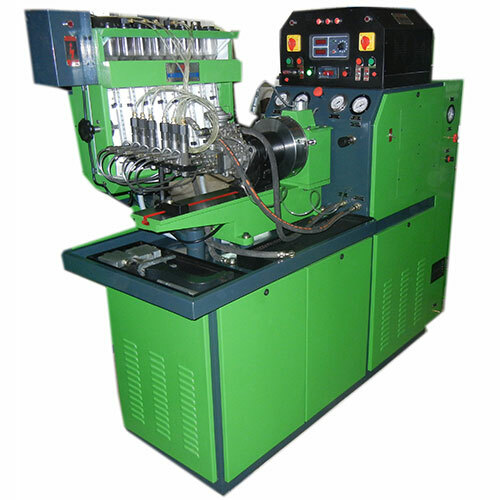 Allhigh pressure pipes, rail return pipe, injector output delivery and return adaptors, all electrical couplers for different kinds of common rail injectors / pumps of Bosch, Delphi, Denso and Siemens make, and all other necessary accessories for Common rail testing. 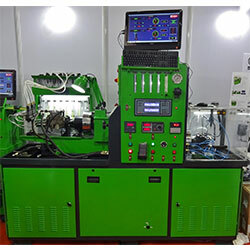 Test Bench also comes fitted with the EDC 7000 Simulator for driving and testing of Electronic diesel control / EDC electronic VE pumps such as the Bosch VP series pumps – VP 36, VP 37etc. 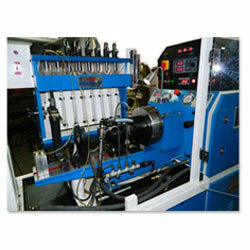 Pressure developed in the system while Common rail testing can be regulated from 0 – 2000 BAR, as the user desires. 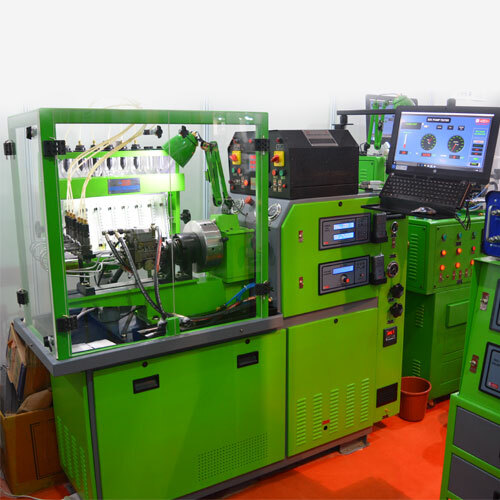 The testing area of the test bench for Common rail testing is well shielded with an unbreakable transparent acrylic shielding, which can be opened / closed when desired. This is for the safety and protection of the operators when observing spray pattern / performing other CR injector and pump tests etc. as the pressures involved in CR testing are very high. EDC / Electronic VE pumps such as Bosch VP Series â VP 36, VP 37 etc. RPM: Variable from 0 - 5000 RPM. 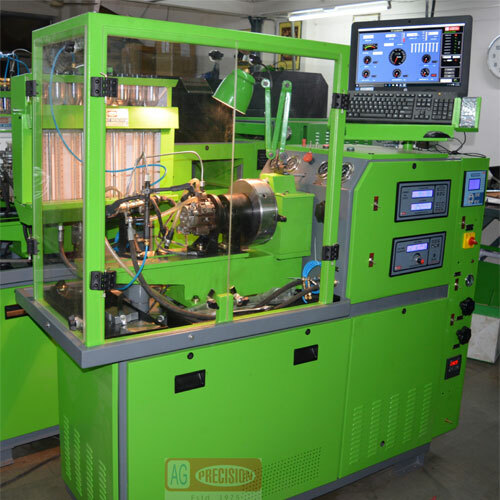 Test Bench also comes fitted with the EDC 7000 Simulator for driving and testing of Electronic diesel control / EDC electronic VE pumps such as the Bosch VP series pumps â VP 36, VP 37 etc. Pressure developed in the system while Common rail testing can be regulated from 0 â 1800 BAR, as the user desires. The main testing area of the test bench is well shielded with an unbreakable transparent acrylic shielding, which can be opened / closed when desired. This is for the safety and protection of the operators when observing spray pattern / performing other CR injector and pump tests etc. as the pressures involved in CR testing are very high. All types of Lucas / Delphi Rotary pumps including DPC'. Main Motor : 7.5 or 10 HP (as per customer requirement). Pressure Gauges : Digital and Analog. Fuel Supply Motor : 1 HP. 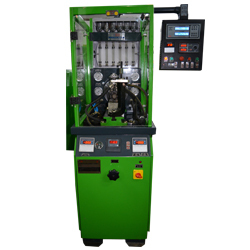 Pressure developed in the system while Common rail testing can be regulated from 0  1800 BAR, as the user desires. Power Supply : Customizable according to Customer requirement. All types of Lucas / Delphi Rotary pumps including DPC. 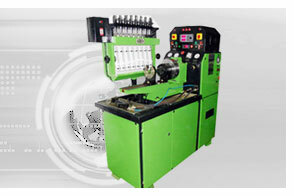 Drive : Available in Variator or Hydraulic Drive (as per customer requirement).